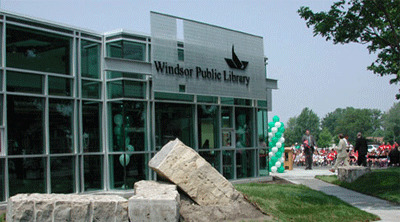 After a year of construction, Windsor Public Library’s branch, Bridgeview, opened in June 2002. More than 400 Windsorites came out to celebrate the opening at the magnificent glass-walled building. Formerly located on Huron Church Road and named Ambassador Library, the new site is in a safe location in the heart of the community. The name Bridgeview was chosen as a result of a public contest won by nine year-old Sharissa Morrison, who lives in the neighbourhood. Bridgeview Library has 5 public and 1 express computer stations, free Internet access, a collection of 35,000 items and an expert staff who can help you find what you need.